We have combined a medley of sweet and tangy guava and infused it into a delectable macadamia cookie for the ultimate island treat. Guava fruit is best known for its green exterior, reddish pink meat, and its sweet and sour flavor. 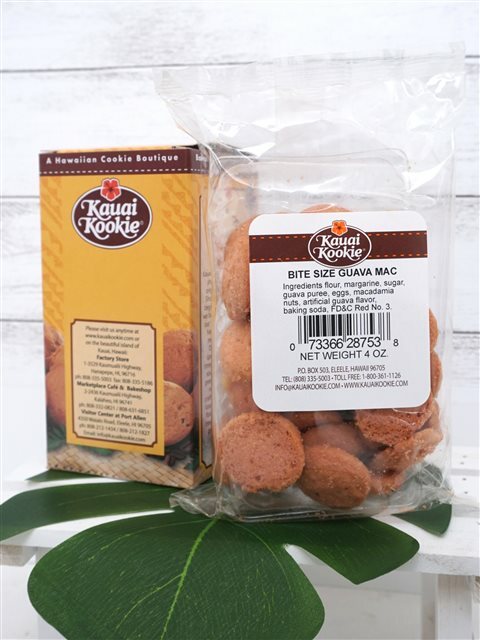 At the Kauai Kookie factory, we have incorporated this exotic fruit into our signature cookies for a deliciously tangy snack you will not be able to put down! Real guava puree and crunchy macadamia nuts are added to our home-style cookies for an enticing island taste. WHEAT FLOUR BLEACHED, MALTED BARLEY FLOUR, NIACIN (a B VITAMIN), IRON, THIAMIN MONONITRATE (VITAMIN B1), RIBOFLAVIN (VITAMIN B2), FOLIC ACID, BUTTER (CREAM, SALT), MARGARINE (PALM OIL, WATER, CONTAINS LESS THAN 2% OF SALT, VEGETABLE MONO & DI-GLYCERIDES, NATURAL FLAVOR (INCLUDES MILK), CITRIC ACID, VITAMIN A PALMITATE ADDED, BETA CAROTENE (COLOR)), GRANULATED SUGAR, GUAVA PUREE, WHOLE EGGS, MACADAMIA NUTS, ARTIFICIAL GUAVA FLAVOR, BAKING SODA (SODIUM BICARBONATE), FD&C RED NO. 3. CONTAINS: WHEAT, EGGS, SOYBEAN, MILK, MACADAMIA NUTS. ALLERGEN WARNING: PRODUCED IN A FACILITY THAT ALSO PROCESSES PEANUTS AND TREE NUTS.